3-Pin Laptop/Notebook Power Cord - 1 ft.
Our 3-pin black laptop power cord can be used with any portable computer to connect to a wall socket or outlet. It has a three-pin C5 (female) laptop power connector on one end and a NEMA three-prong 5-15P (male) plug on the other end. The cord has three conductors and is polarized to prevent shocks. At 1-foot long, this laptop 3-prong power cord is best used for semi-permanent office setups or for recharging a low battery. 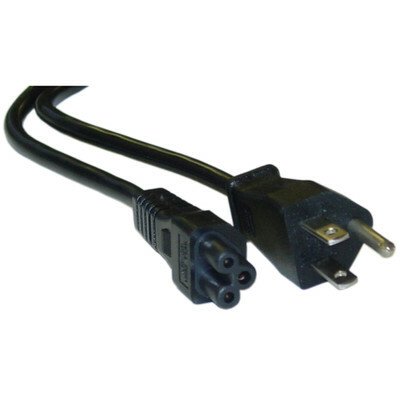 CableWholesale also has 6-foot and 10-foot power cords available. Item was exactly as described and was perfect for what I needed. These are great quality cables. I love to buy the short cables as It really reduces clutter in cable management. Cablewholesale is a great company that always delivers what they promise in a timely manner. Very pleased! !